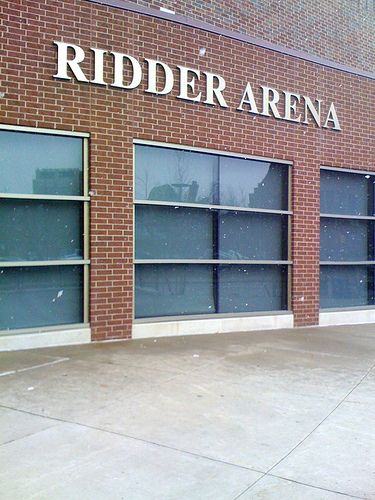 This will be my last article before I leave Wednesday afternoon for Minneapolis and begin blogging from the tryout camp. My next article should be posted late Thursday evening, after the first session. We will also try to post the tryout camp rosters here on the blog as soon as I receive them. 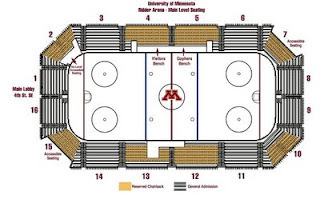 There is free wifi available inside Ridder Arena, so I may try to do some updates during the day, but most of my camp recap articles will come later at night after the scrimmages are complete. I am also going to utilize the "Black and Blue" Twitter account quite often throughout the camp with quick bits of information during each day. I'll include that link below. It might be a good idea to bookmark the Twitter link in order to follow along. Better yet, if you're on Twitter already, give the B³ a follow. 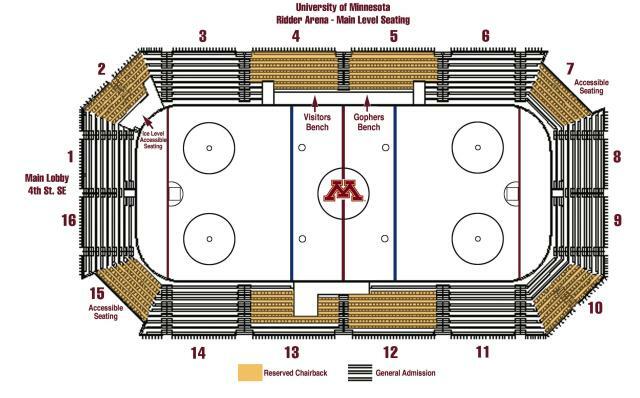 Looking at the Ridder Arena seating chart (pictured below-click to enlarge), I will most likely camp out at the top of section 12 or 13, so if you see me sitting there taking notes, please feel free to introduce yourself. I always enjoy meeting the folks who read this blog. If you want to spot me, I'm about 6'3", 200 pounds, glasses, beard, and I will probably be wearing a black "Bauer" jacket. I'll also be lugging around my laptop backpack. Have a safe trip, Yeti! Will be interested to hear your thoughts on the camp. Thanks for everything you do for the blog.